Kolmanskop just blows my mind. If you're a photographer and visiting Namibia, you really have to put this place on your must-visit list (along with Deadvlei and Etosha). You won't regret it. There's so many photographic gems of rapid decay here. The town was only abandoned 60 years ago, a fraction of a blink of an eye in our cosmic history, but the sand acts fast to reclaim the land from these buildings in the desert. Crawling through windows and walking around these abandoned buildings in solitude is quite gratifying and quietly exciting at the same time. 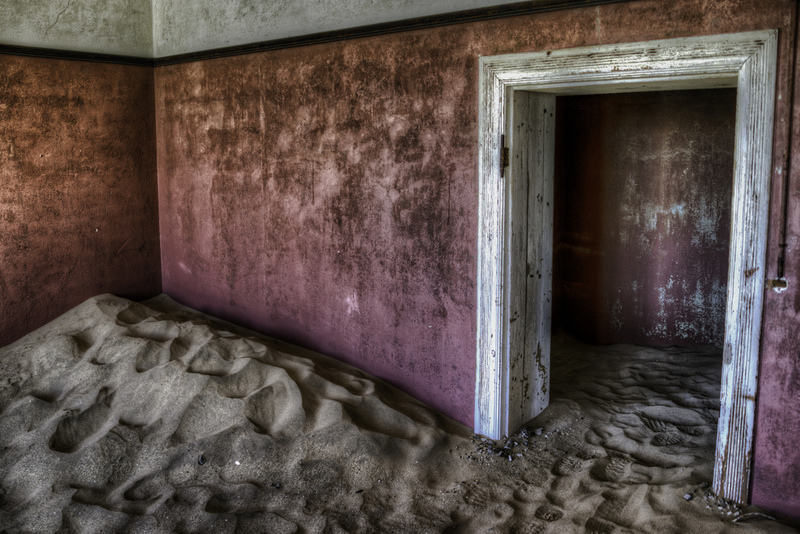 Desert sand infiltrating the interior of an abandoned building in Kolmanskop Ghost Town.